Military Pokes Holes In Acupuncture Skeptics' Theory In an effort to shake up a "pill for every ill" approach, the Army is making alternative treatments more widely available. Among the new options is acupuncture, which some veterans say is making them less dependent on painkillers. That doesn't mean there isn't resistance, including from many in uniform. In a fluorescent-lit exam room, Col. Rochelle Wasserman sticks ballpoint-size pins in the ears of Sgt. Rick Remalia. 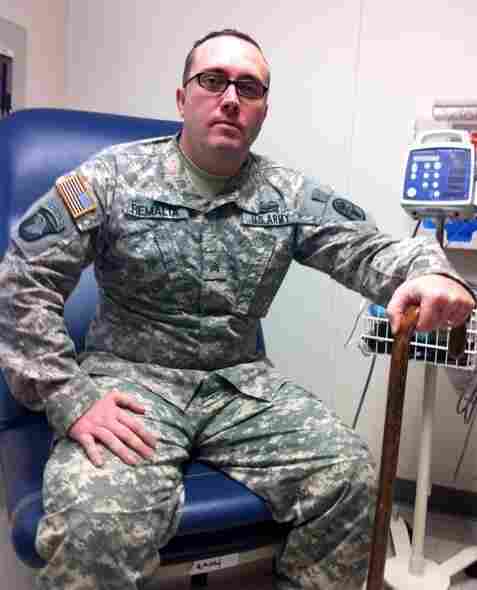 Remalia broke his back, hip and pelvis during a rollover caused by a pair of rocket-propelled grenades in Afghanistan. He still walks with a cane and suffers from mild traumatic brain injury. Pain is an everyday occurrence, which is where the needles come in. "I've had a lot of treatment, and this is the first treatment that I've had where I've been like, OK, wow, I've actually seen a really big difference," he says. Army doctors have been told by the top brass to rethink their "pill for every ill" approach to treating pain. For the 47,000 troops who've been wounded in Iraq and Afghanistan, some of the new options include less tried and true methods, like massage and chiropractic treatments. The military hopes to win over skeptics, many of them in uniform. Wasserman is the top doctor for the Warrior Transition Battalion at Fort Campbell, Ky. To her own surprise, she's also now the unit's physician trained to do acupuncture. "I actually had a demonstration of acupuncture on me, and I'm not a spring chicken," she says, "and it didn't make me 16 again, but it certainly did make me feel better than I had, so I figured, hey ... let's give it a shot with our soldiers here." In recent years, military doctors have turned to acupuncture in special pain clinics and for troops in battle zones. Last year, the Army surgeon general began making the alternative treatments more widely available. Virtual Penguins A Prescription For Pain? Remalia says his headaches have disappeared, and he's relying less on his cabinet full of pain medication. To Col. Kevin Galloway, that's mission accomplished. He's in charge of carrying out recommendations from the Army's Pain Management Task Force, which focused heavily on unconventional therapies. "You can throw fairly cheap pharmaceuticals at the problem now and push the problem to someone else later if you're not really working on what the genesis of the pain is," he says. Galloway says if soldiers get hooked on high-powered painkillers, the Department of Veterans Affairs may be dealing with the side effects for decades to come. Already, at least 40 percent of veterans entering the VA system are coping with pain. New academic studies from places like Duke University back up acupuncture as an alternative to medication. But Harriet Hall, a former Air Force flight surgeon, shares the skepticism found in many corners of the medical community. "We call that 'quack-ademic' medicine when it gets into medical schools," she says. The way she reads the science, acupuncture does no more than a sugar pill. To offer a placebo, she says, is unethical. "The military has led the way on trauma care and things like that, but the idea that putting needles in somebody's ear is going to substitute for things like morphine is just ridiculous," Hall says. As some top medical officers put it, though, there's nothing like pain to make someone open-minded. Staff Sgt. Jermaine Louis says he's tried it all. "Physical therapy, occupational therapy, PTSD group, anger group, stress group ... everything," he says. Louis is trying to overcome a traumatic brain injury that followed him home from Iraq five years ago. He's still dependent on medication, and the soon-to-retire infantryman says he's scared. "[Scared] that I have to be on it for the rest of my life and [that] I will get accustomed just to taking them, and I don't want to be that way," Louis says. "I want to be normal like everybody else." But if being normal depends on regular acupuncture treatments, the Defense Department has more convincing to do. TRICARE — the military's own health plan for service members and retirees — still doesn't cover acupuncture.